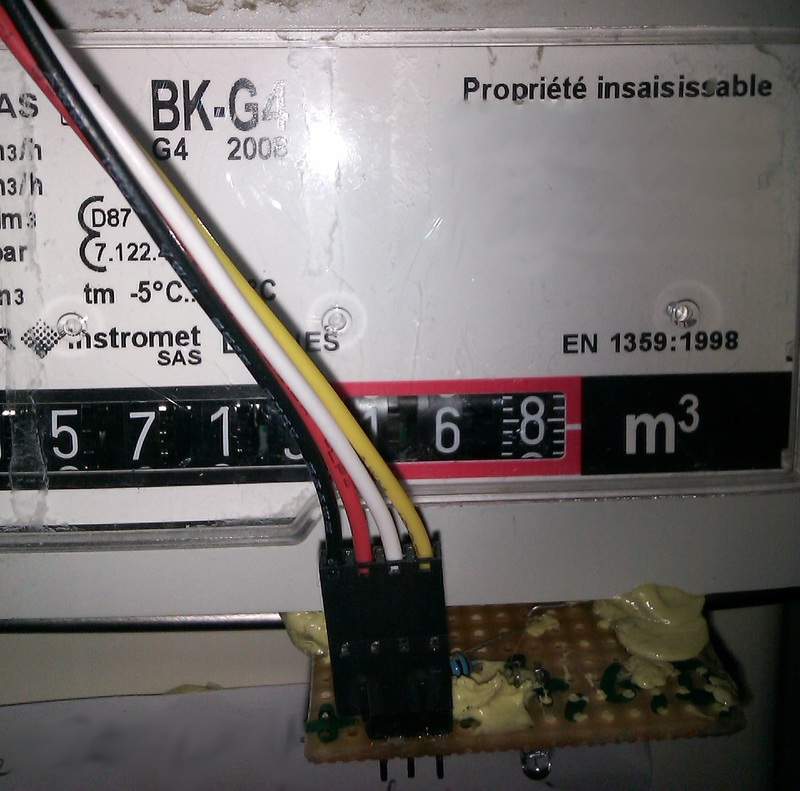 [Sven337] just blogged about a gas consumption monitoring setup he finished not long ago. As his gas meter was located outside his apartment and nowhere near any electrical outlet, a battery-powered platform that could wirelessly send the current consumption data to his Raspberry Pi was required. His final solution therefore consists of a JeeNode coupled with the well known nRF24L01+ wireless transmitter, powered by 3 supposedly dead alkaline batteries. [Sven337] carefully looked at the different techniques available to read the data from his meter. At first he had thought of using a reflective sensor to detect the number 6 which (in France at least) is designed to reflect light very well. He then finally settled for a magnetic based solution, as the Actaris G4 gas meter has a small depression intended for magnetic sensors. The PCB you see in the picture above therefore has a reed sensor and a debug LED. The four wires go to a plastic enclosure containing the JeeNode, a couple of LEDs and a reset switch. Using another nRF24L01, the Raspberry Pi finally receives the pulse count and reports it to an eeePC which takes care of the storage and graphing.